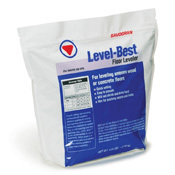 A quick-setting non-shrinking compound for leveling and repairing uneven surfaces or floors prior to installing coverings, tile or carpet. It is recommended for patching dents or holes in walls. 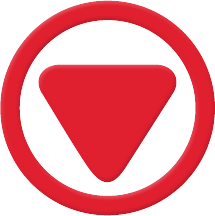 Level-Best® holds firm due to its strong adhesive qualities, but is easy to work and dries smooth. It is not recommended for below-grade or wet locations, or for surfaces supporting heavy machinery. 12832 4.5 lbs. 6/case 049542128322 30 lbs. 14834 25 lbs. Bag 049542148344 27 lbs. 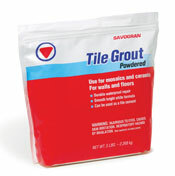 A bright-white grout for new tile installation or repair that is waterproof when dry. It mixes to a smooth paste and can be used to set ceramic fixtures or tiles or seal around tubs, showers and sinks. Tile Grout will not crack or shrink after setting. It sets up quickly and stays white and hard. 12841 1 lbs. 12/case 049542128414 13 lbs. 12842 5 lbs. 6/case 049542128421 32 lbs. An acrylic latex grout for repair applications that is waterproof when dry. It can also be used to set ceramic fixtures and tile or seal around tubs, showers and sinks. 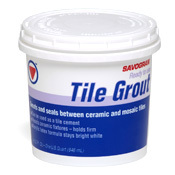 Tile Grout is a ready-to-use smooth bright white formula and will not crack or shrink after setting. It sets up quickly and can be tinted with universal colorants. 12860 1/2 Pint 12/case 049542128605 13 lbs. 12861 Pint 12/case 049542128612 23 lbs. 12862 Quart 6/case 049542128629 23 lbs. A concentrated remover that softens wallpaper paste to aid in the removal of old wallpaper. Fast® should be diluted with water and applied by sponge or roller to soak the old wall covering. Washable or painted wall coverings must be perforated well to allow Fast® to penetrate. 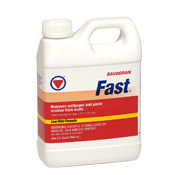 Use Fast® as an afterwash to clean traces of paste from walls prior to recovering. Fast® contains Bitrex® to hinder accidental swallowing by children. 10771 Pint 12/case 049542107716 14 lbs. 10772 Quart 6/case 049542107723 14 lbs. 10773 Gallon 4/case 049542107730 36 lbs. Wood Bleach contains oxalic acid which, when mixed with hot water, effectively bleaches unfinished or stripped wood quickly and easily. 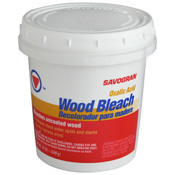 Wood Bleach is excellent for removing black water spots and tannin stains in wood. Use on all unfinished woodwork, floors, doors, etc. to lighten wood or match different wood colors. 10501 12 oz. 12/case 049542105019 11 lbs. 10502 25 lbs. Pail 049542105026 26 lbs. 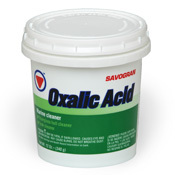 Oxalic Acid Marine Cleaner effectively cleans boat hulls removing “tea” stains, algae stains, dirt and grime. The product cleans and brightens teak and mahogany. Easily removes rust and tarnish from stainless steel and aluminum. 10503 12 oz. 6/case 049542105033 6 lbs.